What's even harder than creating a breakthrough strategy? Making it stick. 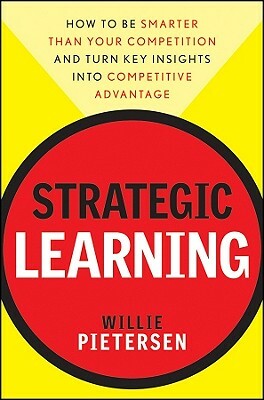 As companies are fighting to survive in a tough economy, this new book by Willie Pietersen demonstrates the power of the Strategic Learning process, a four-step dynamic cycle guaranteed to create and sustain winning performance. Adopted by a wide range of corporations and not-for-profit organizations, the Strategic Learning process builds on eight years of practicing, adapting and honing the original concepts Pietersen first introduced in Reinventing Strategy to explain how organizations can generate superior insights about their customers and competitors, craft a Winning Proposition, focus on a vital few key priorities, create buy-in throughout the organization and achieve success - again and again. Willie Pietersen was raised in South Africa and received a Rhodes Scholarship to Oxford University. After practicing law, he embarked on an international business career, serving as the CEO of multibillion-dollar businesses such as Lever Foods, Seagram USA, Tropicana, and Sterling Winthrop's Consumer Health Group. Since 1998, Pietersen has been Professor of the Practice of Management at the Columbia University Business School. He has served as teacher and advisor to many global companies, including Boeing, Deloitte, DePuy, Ericsson, ExxonMobil, Novartis, SAP, and the Girl Scouts of the USA. He is the author of Reinventing Strategy, which is widely used by organizations as a guide to the creation of winning strategies, and has been translated into Spanish and Chinese. For more information about the application of Strategic Learning, visit www.williampietersen.com.